Be Wary of Canada Geese! Canada geese have paired up by this time of year and many females are already sitting on nests with eggs. Be cautious around the geese and give them space. Right now, the goose pair's main objective is to protect that nest. The male spends much of his time guarding the female, whether she is eating, resting, or sitting on the nest. Several times in the past few weeks, I have encountered a goose pair and each time they have behaved defensively. Once I backed away and gave them some space, there was no problem. If a goose approaches you, starts bobbing its head, hissing, or flapping its wings, back away slowly and realize you have gotten too close to a nesting territory or nest itself. Be sure to keep an eye on children as well. With the prevalence of geese around public ponds in parks and other recreational areas, human-goose encounters are common. Once a goose pair has built a nest and laid eggs, it is almost impossible to get them to leave. Prior to nest building, harassment techniques can be used to remove geese from an area. As this species is protected by law, nests with eggs cannot legally be harmed without a permit from the U.S. Fish and Wildlife Service. If a community is having serious conflicts with geese, a goose damage permit may be issued by the Ohio Department of Natural Resources (ODNR), Division of Wildlife. 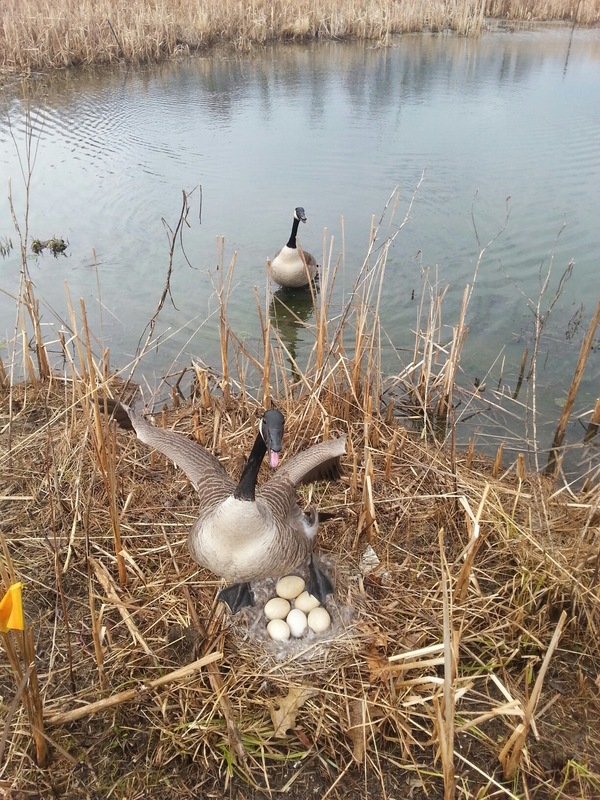 Visit [https://apps.ohiodnr.gov/wildlife/goose/] to submit a Goose Damage Report, the first step in applying for a permit. For more information, click here for a fact sheet on Canada goose conflict management.